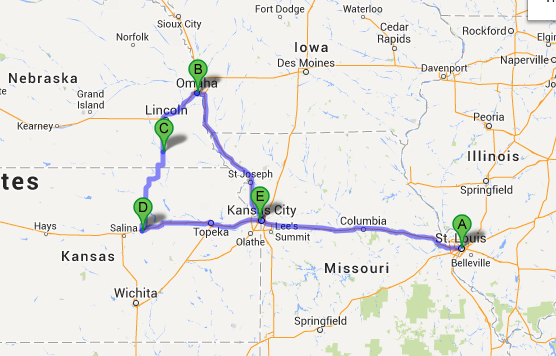 For the Martin Luther King long weekend, I decided to take a road trip to Nebraska and Kansas. Four things collided that inspired me to take the trip. First was the long weekend- with Fridays off, I had 4 days to explore. 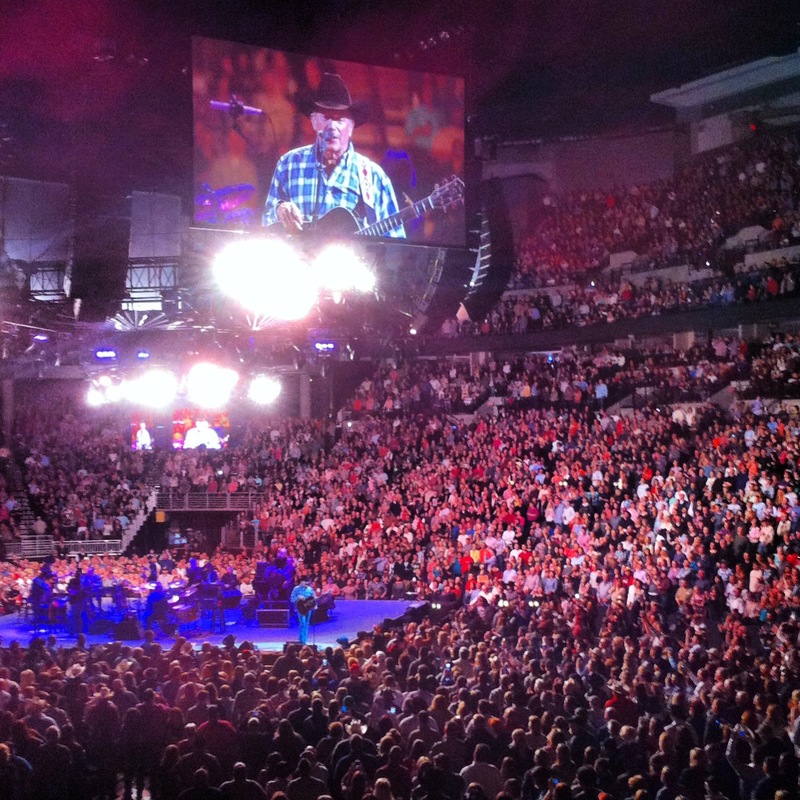 Second, was the George Strait concert in Omaha. George is retiring from performing after this tour and this weekend was the only date within driving distance. Third was sorority recruitment at Wash U, which meant that nothing was going to happen on campus. And fourth, I wanted to visit some graves in the cemetery in Kansas City. I arrived in Omaha around 3:30, which was a bit later than I hoped, because most attractions closed at either 4 or 5. 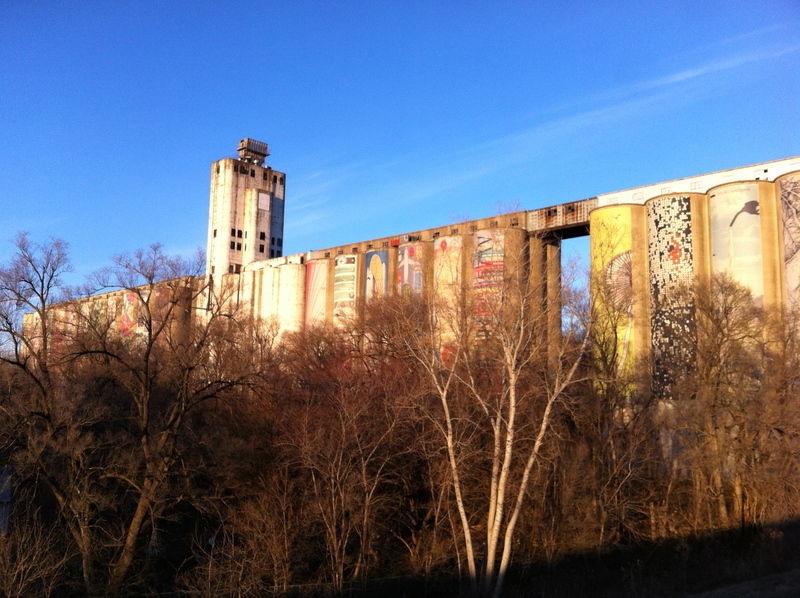 So, I checked into my hotel and drove around Omaha stopping at Warren Buffet’s house, the birthplace of President Gerald Ford, and this sweet abandoned grain co-op. Then, because it is Omaha, got an awesome steak dinner. That night, I went to the George Strait concert at the CenturyLink Arena, which is connected with the convention center. George Strait is known as the “King of Country” and has 60 country Number 1 songs. The entire tour sold out in minutes, but I was lucky to snag a seat on Stubhub last minute for a reasonable price. The guy sitting behind me paid over double what I did. Eric Church, who headlines arena shows, was the opener. He played a rare solo acoustic set, which allowed the audience to really test the mettle of his songs. 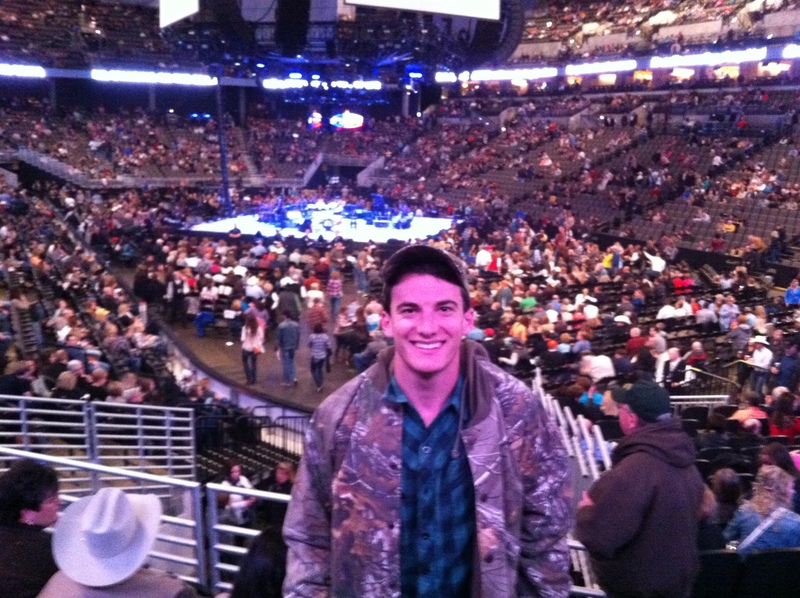 Getting my country on at the George Strait show. Soon after, George Strait entered the arena. He performed on a center stage, facing a different side of the crowd every few songs. For the next 2 ½ hours he dazzled the crowd with 35 songs. I knew the lyrics to all but 3 of them. As he played my favorite song of all time “Amarillo By Morning”, I knew right then and there that this would be one of the best weekends of college. 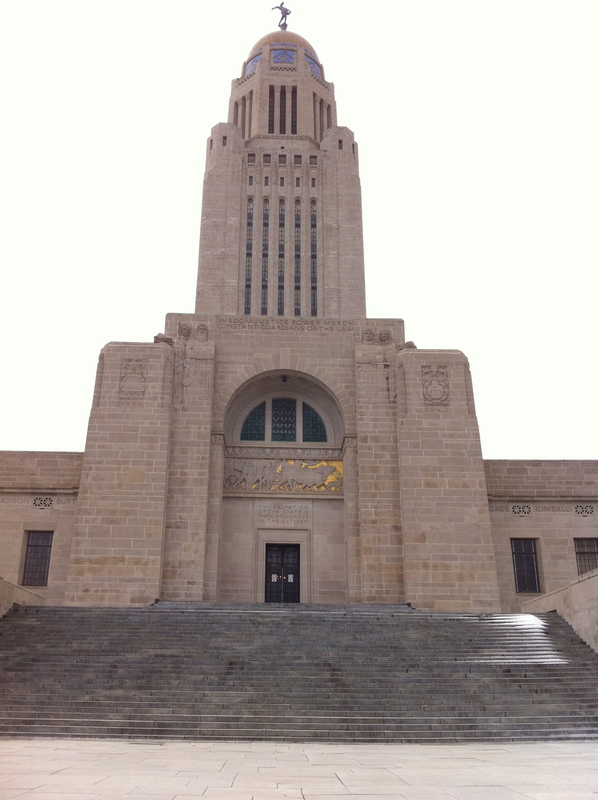 The next day, I got an early start and headed to Lincoln, Nebraska to see the art deco state capitol building. This is the 19th state capitol building I have visited in a quest to see them all. The Nebraska capitol is the third tallest building in the state. 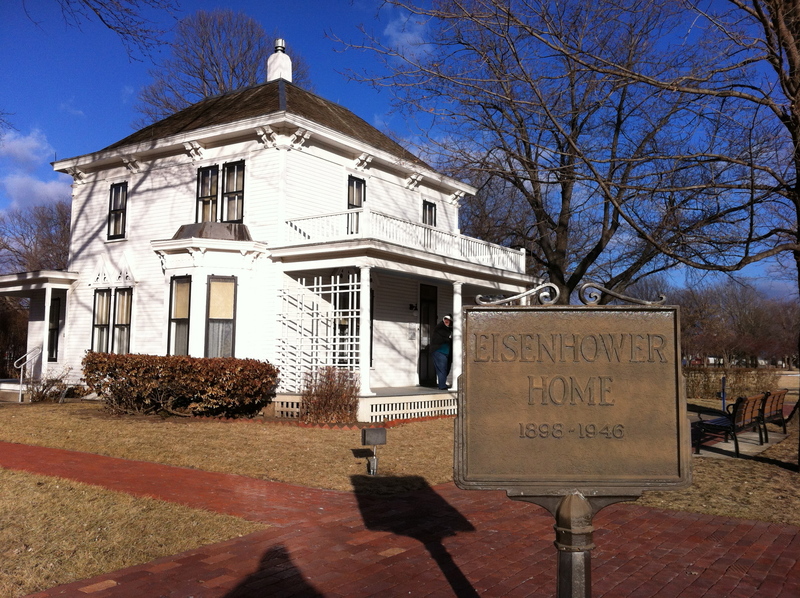 I then drove down 4 hours south into Kansas to the town of Abilene, to visit the Eisenhower Presidential Library. Interestingly, the library was founded while Ike was a general and was simple expanded after he became president. As a result, most of the museum is about World War 2 and showcases his military awards with very little about his presidency. I ate dinner in Abilene at the Brookville Hotel, the most famous restaurant in the state of Kansas and a winner of a prestigious James Beard award. 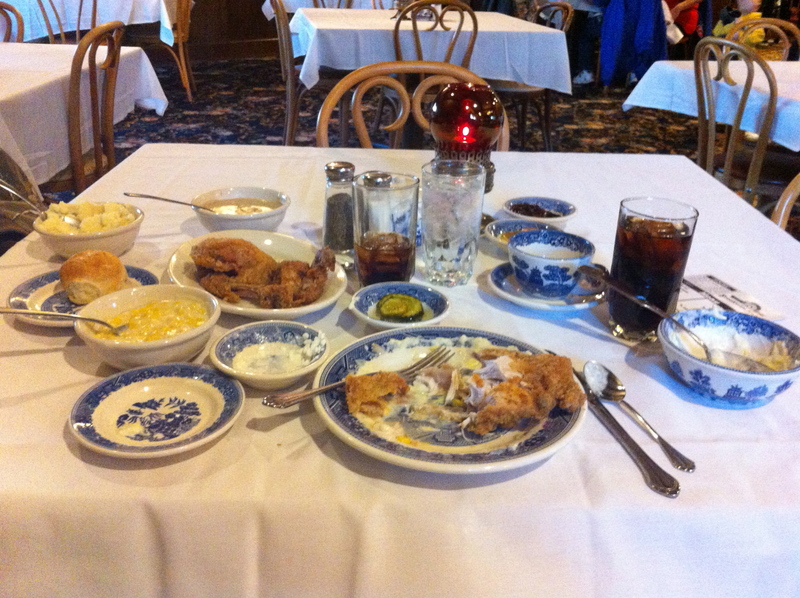 The restaurant was family style, which meant that by dining alone, I got the entrée and all the table sides to myself. After eating an enormous portion of fried chicken, mashed potatoes, cottage cheese, cream corn other comfort sides, and ice cream, I struggled to walk back to the car. On Sunday, I stopped in Topeka to see the Westboro Baptist Church, the people who hate gay people and protest all over the world. It looked like a house in the middle of a neighborhood, not a church. It was decorated with loads of anti-gay slogans and decorations. 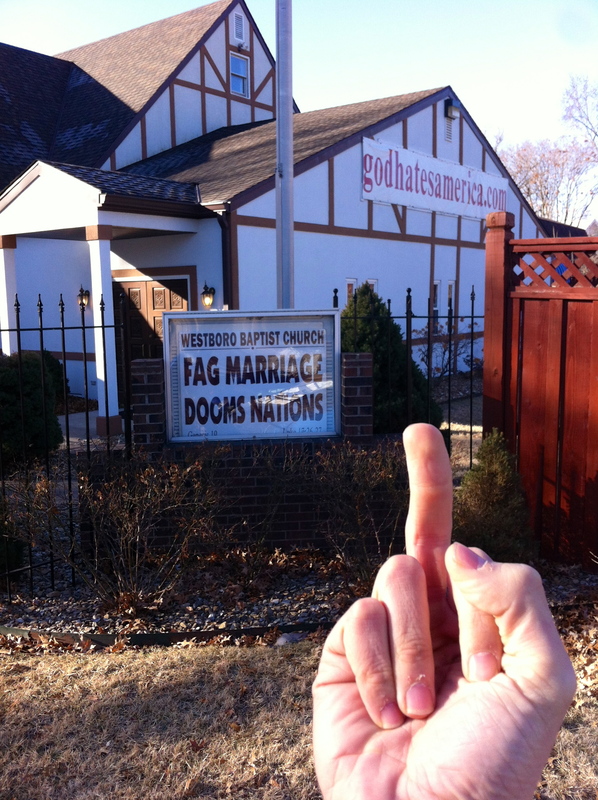 I have a weird theory based on absolutely nothing that the members of the Westboro Baptist Church are miserable because they live in Topeka, which is not the most interesting city and that their anti-gay protests give them the opportunity to travel all over the country on the dime of racists. For example, next weekend, the church is taking a big vacation to New York City for the Super Bowl. Their current picket schedule has them picketing for only 2-4 hours each day, which gives them plenty of time to explore the city. Interestingly across the street, there was a house painted rainbow with gay pride flags flying in the yard. 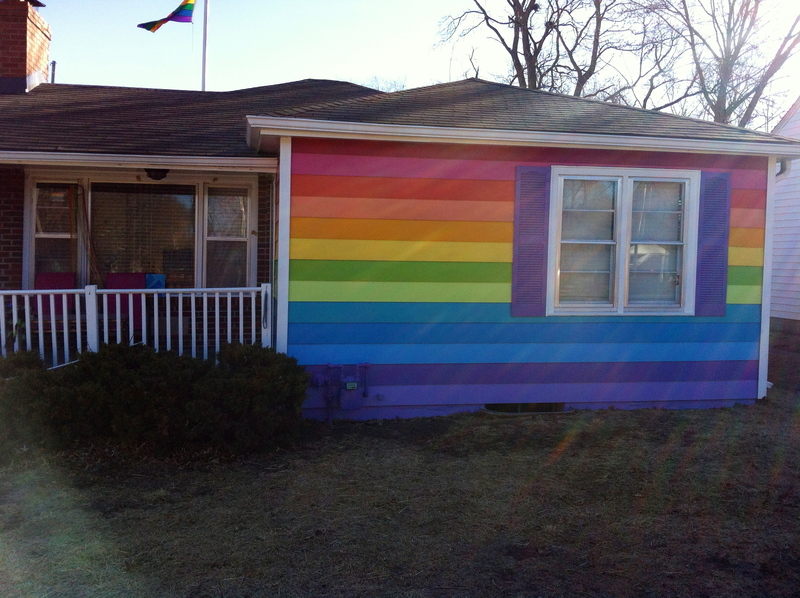 It is called the Equality House. Displays like this give me hope in humanity. I then drove back into Kansas City, completing my 550-mile loop through the Great Plains. I stopped at the recently redone National World War 1 Museum. 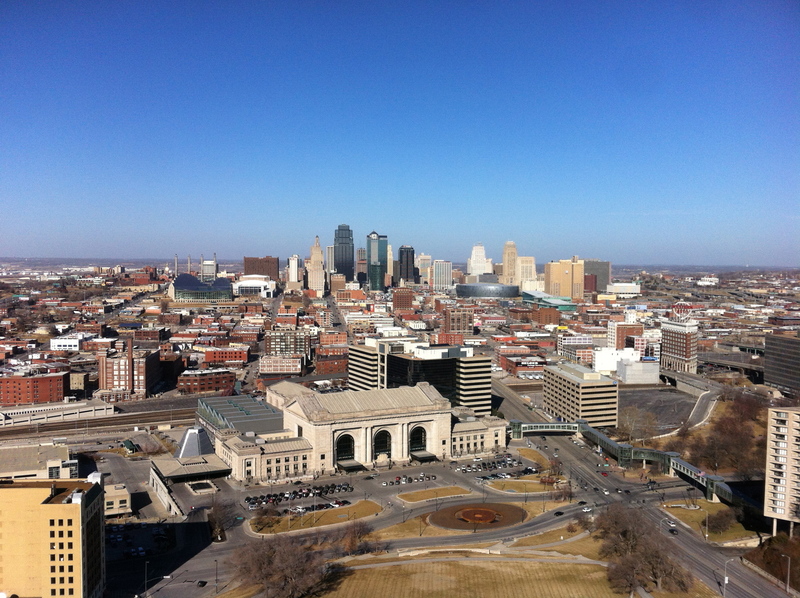 Part of the museum is a 200 ft. tower, which has an amazing view of the Kansas City skyline. After the museum, I went to my Uncle Andy’s house in the suburb of Leawood where we watched the NFL conference championships. It was really nice to see my uncle and cousin Jono, who is now an accountant. Good day KC! It was also 65 degrees in January!! The next day I went to visit my grandpa and step-grandpa in the nearby cemetery. The family story is long, but here is the abridged version: My grandma Dorothy divorced my grandpa Walter 35 years ago and remarried my step-grandpa Lester 25 years ago. Walter stopped all contact with my family, and my Lester, filled the role as my grandpa growing up. 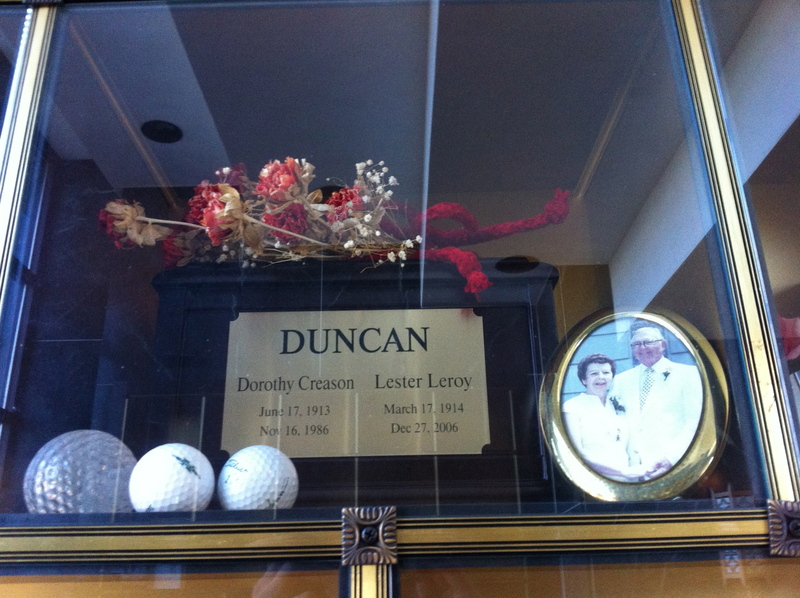 Lester died in late 2006. My parents didn’t let me go to the funeral because I had school that day. My step-grandpa Lester and his first wife of 50 years. I actually had no idea she even existed until this moment. 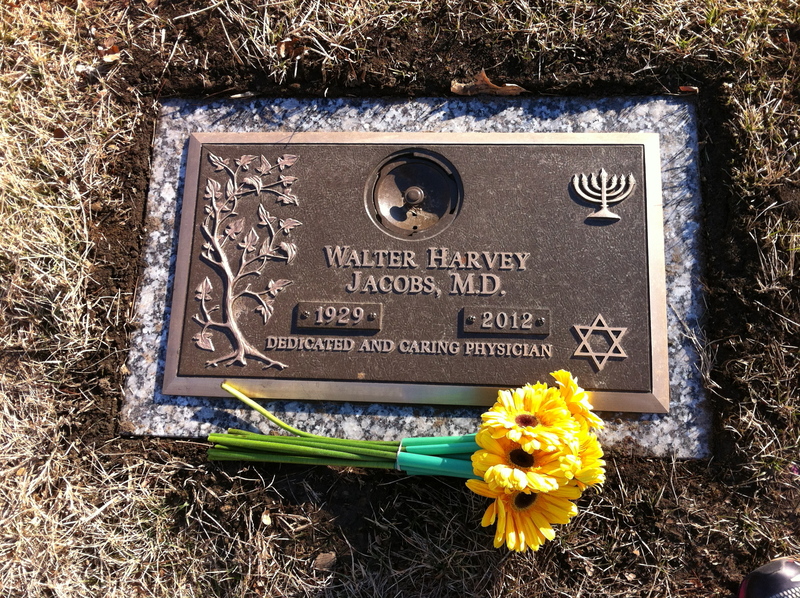 About 5 years ago, my mother re-contacted Walter and was able to see her dad for the first time in decades. One time when I was in Kansas City in 2009, we got BBQ with Walter. That was the only time I met him in person before he died in 2012, although we talked on the phone many times. Again, my parents would not let me go to the funeral because I had class. Interestingly, Walter and Lester are now located in the same cemetery about 100 yards away from each other. I visited each of their graves and left them each roses for my mother, Jacqueline Rose. Visiting these two graves gave me the closure that I had sought for years. My grandpa Walter. In addition to roses, I gave him sunflowers, the state flower of Kansas. While in the cemetery, I cried for the first time in years. To overcome my grief and clear my head, I drove south to the Oklahoma border and back (about 4 hours round trip). My original plan for the weekend was to go home after visiting the cemetery. 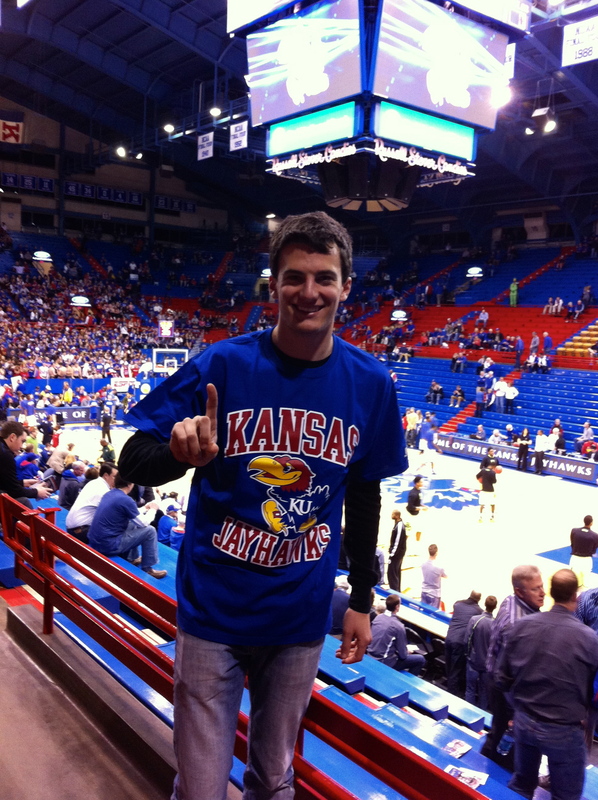 However, I got an offer for cheap tickets (1/4 face value) to the Kansas basketball game that night in Lawrence, about 45 minutes west of Kansas City. The game started at 8, however because I had class the next day, I decided to leave at halftime which would get me back to St. Louis at my usual bedtime of 1:30 am. 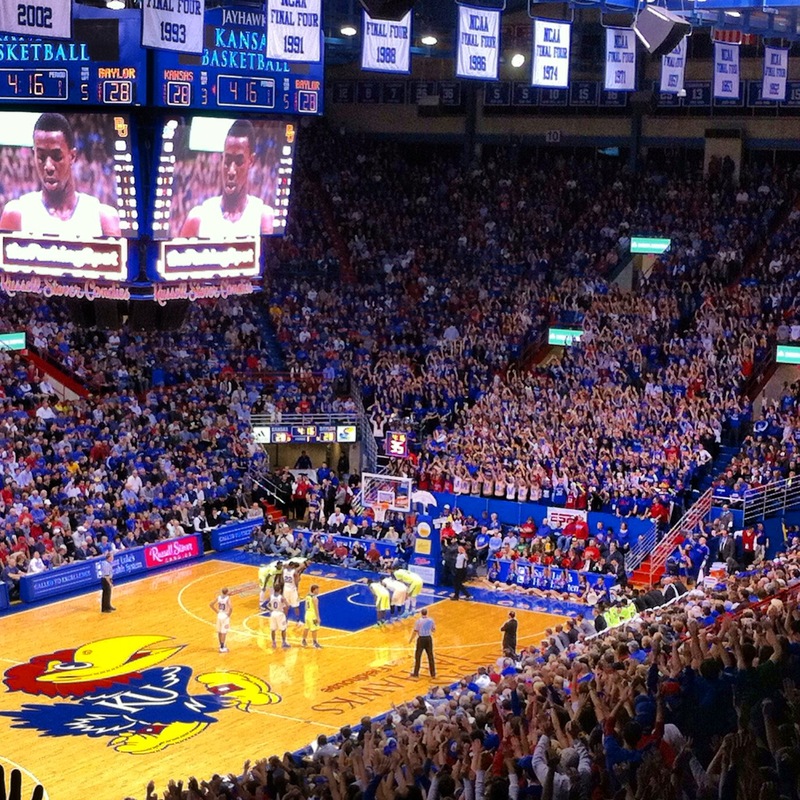 Kansas has sold out every baskeball game since 2002. I got to the arena 90 minutes before the game only to find the place completely full since most of the seats are general admission. As a result, I was seated in the third to last row. The energy in the arena was unlike anything I have ever seen, especially right before tip-off when they posted the decibel level of the crowd on the big screen (it got up to 112). I ended up leaving at halftime with KU leading by 1. They ended up winning the game by 12 points. Before driving back, I checked the weather report, which called for 25-35 mph winds. Unfortunately, about an hour outside of St. Louis, I ran into an unexpected heavy snowstorm. For about 10 minutes I followed in the tracks of a semi-truck. On a curve in the highway, I skidded on the ice and started fishtailing. Luckily, I took a stunt-driving course back when I was 16 and was able to regain control of the car. However, I decided to stop driving for the night and pull off at the nearest exit, which was a truck stop. I slept in my car in a sleeping bag I had brought just for this situation (definitely learned something from doing Outward Bound). I slept three 2-hour segments broken up by turning on the car for warmth before hitting the road around 7:30 in the morning. Unfortunately, the roads were still not plowed, so it took me a very long time to get back to my apartment, but most importantly I made it back safely. Thanks for sharing. Great story well written. Bryce, you are an amazing story teller –I have read other blogs by you. I think you could be a successful travel writer.